While the snow melts in Montreal and spring is slowly starting to bloom, the grass and flowers aren’t the only things being uncovered in the city. 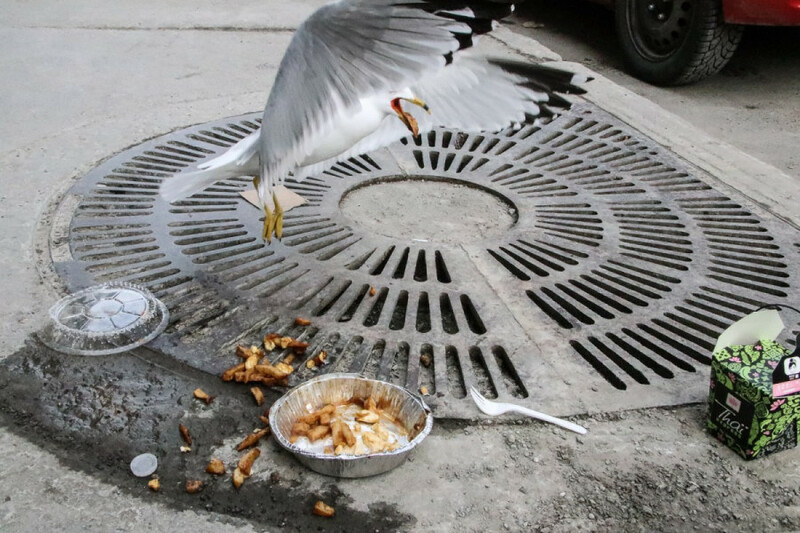 Food waste can be seen on the streets of Montreal, as partiers toss their two-dollar chow mein, a staple of St. Laurent St., on the street as they go. But the booming nightlife industry can come at a cost, as restaurants toss an abundance of food in the trash. The issue of food waste is vital, as one third of the world’s food supply is wasted, resulting in a loss of 1.3 billion tonnes of food, according to the United Nations. In Montreal, food waste accounts for an average of 27 per cent of garbage thrown out by residents. Ching-Chih Chen, a part-time manual labourer who also sits on the board of directors for the Concordia Food Coalition, said food waste is part of North American culture. As a manual labourer for Compost Montreal, he collects large amounts of food waste from restaurants. In his work, Chen said he’s noticed one restaurant tends to produce an average of about 500 litres of food waste every two to three days. He often finds restaurants throw out perfectly fine food, like lettuce that has edges that have turned a bit yellow, because the food isn’t aesthetically pleasing enough. It’s not just the food that is wasteful, but it is also the process in how our society manufactures food, he said. “Industrial agriculture is really not sustainable. It’s slowly strangling the earth and it’s a dilemma how we got into that,” said Chen. As industrial agriculture was generated to help feed more people, Chen said this method does not stop the original problem governments and industries said they wanted to solve. Industrial agriculture makes use of agricultural machinery and pesticides as an aid to produce large amounts of food. Chen said with a greater abundance of resources, there is less care in what happens to the waste of those products. Erik Chevrier, a part time professor in Concordia’s Sociology and Anthropology department, said the issue of food waste is aggravated by our economic and political system. However, Chevrier said the problem won’t necessarily go away with a new economic system. In systems more dominated by the state than businesses, he said the surplus may go to the state or other community groups. However, he said a state run economy that is looking to produce just as much as a capitalist economy will cause just as much destruction. To make use of surplus food, many in Montreal take to dumpster diving food tossed by markets and grocery stores, that’s thrown for not being aesthetically pleasing or breaching the product’s due date—which often does not always reflect the actual shelf life of the food. 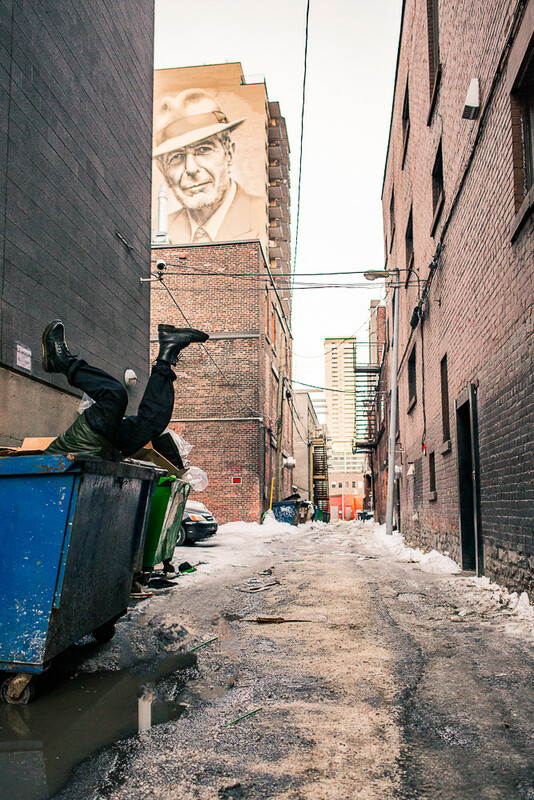 In a dumpster diving workshop hosted at Concordia in March by two members of Lés Echelles, a collective living space, hosts Costanza Graziani and Isabella Donati-Simmons hoped to provide a better understanding of dumpster diving so Montrealers could become less intimidated by the process. Graziani and Donati-Simmons explained that dumpster diving is not a solution to hunger or eradicating poverty. Instead, it is about taking advantage of the abundance of waste. With similar opinions to Chen and Chevrier, both Graziani and Donati-Simmons detailed how our food system aims to produce more, while not adequately providing proportionate distribution for all people. “We have more food, yet there are still a lot of people starving,” said Graziani. Some Montrealers take to dumpster diving to save on buying groceries. Our reporter explores what its like one afternoon by the Hall building downtown. In 2016, an average of 950,000 requests were made each month for food aid, according to statistics compiled from three food banks in Montreal—Moisson Laval, Moisson Montréal and Moisson Rive-Sud. But Donati-Simmons wanted to stress that this practice doesn’t generate systemic change. To help effectively generate less waste and to distance oneself from our food system, Chen suggests growing and preparing your own food. To complete the cycle, he recommends using your own vermicompost—a compost used with worms to help breakdown food. The compost can then be used to provide nutrients to your garden, Chen said. Not only will this cut down waste, but it also makes you more aware of how much you’re wasting, and you can choose to only throw out food when you really need to, Chen continued. “When you go into a supermarket, you have to deal with the problem of shelf life,” he said. Not only is this an issue of waste, but it is a factor that contributes towards growing greenhouse gases in our province, nation, and planet. An estimated 20 per cent of greenhouse gases in Canada result from waste in landfills, with much of those greenhouse gases coming from waste food. In a proper composting system, waste is routinely turned to help air flow through the rotting food, which helps generate organic matter to break down into CO2. Without doing so, methane gas gets created, which is 25 to 28 times more potent in its greenhouse gas effect than CO2. Chevrier said to really address our food waste, personal food production and limiting of personal carbon footprints is not the only necessary component. He said that producing foods locally and within communities is just as important. However, the largest issue at hand is changing our food system and limiting big corporations that mass produce food through encouraging changes in corporate policies.